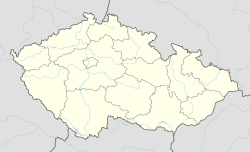 Klenovice is a village and municipality (obec) in Tábor District in the South Bohemian Region of the Czech Republic. The municipality covers an area of 6.56 square kilometres (2.53 sq mi), and has a population of 497 (as at 3 July 2006). Klenovice lies approximately 16 kilometres (10 mi) south of Tábor, 39 km (24 mi) north-east of České Budějovice, and 92 km (57 mi) south of Prague. Wikimedia Commons has media related to Klenovice (Tábor District). This page was last edited on 7 May 2017, at 01:40 (UTC).